inspired after one of my favorite hometown sandwiches from wright's, this turkey melt is anything but soggy (unless you count the globs of melty cheese as soggy and in that case, we can't be friends, because that is beautiful). bread is golden and grilled to perfection, and the tangy brie melds so very well with the crisp apple slices and roasted leftover turkey. serve this up to your fam and you'll be wishing thanksgiving was every week (almost). 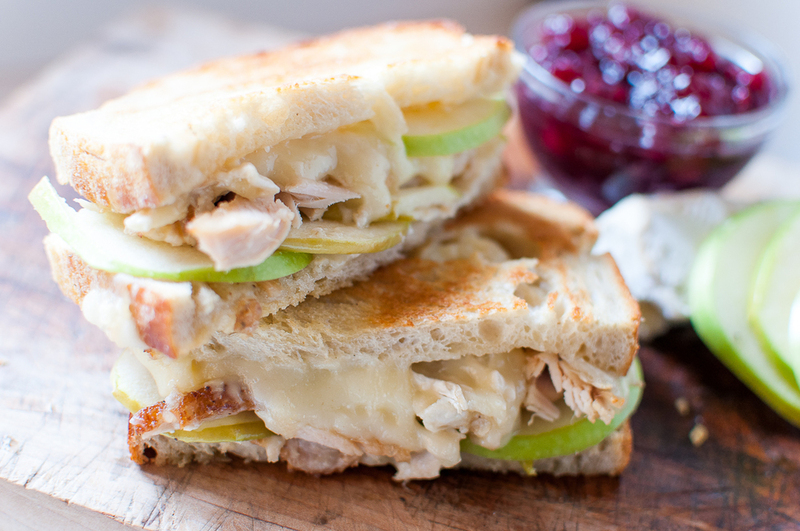 butter each slice of bread on outside and layer the apple slices and turkey on one side, and the brie slices on the other. place both slices, face up, on a baking sheet and broil for 5-7 minutes on HI in your oven until the edges of the bread are starting to brown and the cheese is bubbling. at that point, take the pan out, put the sandwich together and cut in half. butter any un-buttered side you need to, and place back under the broiler for another 1-2 minutes until the top is golden brown. then, dig in and feel free to accompany with any leftover cranberry sauce, mayo, or even a touch of the t-giving gravy (i mean, calories don't count this time of year, am i right? ).